Since framing is a matter of style and taste please feel free to order your portrait without a frame this way you may bring the finished art work to your favorite framer to custom mat and frame. 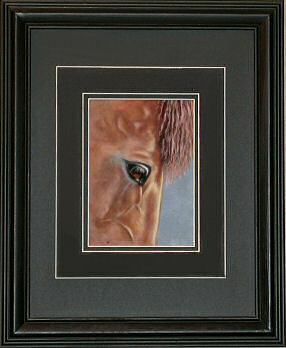 Pastel art work can be framed with or without a mat. If no picture mat is used than your framer will need to use spacers between the glass and artwork. Tip: It is better to choose a frame or mat that harmonizes with both the colors in the painting and the décor with which it will be displayed in. Example: Never choose a frame or mat that is lighter than the lightest light in the picture or darker than the darkest dark. If you do you will tend to see the frame first instead of the art work. For those of you who would like their portraits framed & ready to hang I offer traditional wood frames in rustic styles with linen liners. Please note: Prices are always subjected to change by the frame companies, so please contact me for a current price quote. #33-Rustic black finish with off white linen liner. 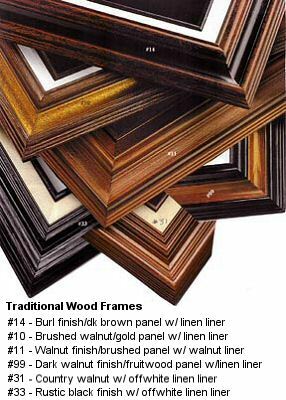 Price of the Traditional Wood frames in the 11x14 size with regular glass & hanging hardware is $60.00 and the 18x24 frame would be $80.00. For those of you who are new to pastels let me introduce you to the oldest medium known. Pastel is pure pigment obtained from stones in the earth and ground into powdered form. 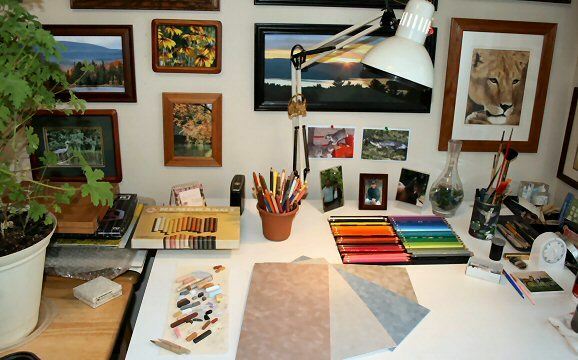 The difference between pastels, oil paints, watercolor paints, gouache or tempera media, is the binder. Pure water, fine powdered clay, and or calcium carbonate are used instead of the oil, gum arabic or egg binders used in other mediums. This liquid is mixed with the powder to form a paste. (Thus the word pastel, which is related to the French word Pastiche). The paste is then rolled into stick form and allowed to dry. Pastels are applied to any ground with a “tooth,” pastel paper, canvas, or cloth. We have many different brands of pastels available to choose from today, from the buttery soft sticks to pastel pencils. Pastels are the most durable of all media when applied to acid free surfaces and kept from sunlight and humidity. In the fifteenth century da Vinci was known to color his drawings with dry pigment and throughout the centuries many great artists such as Renoir, Degas and Picasso also used pastels. Today we have hundreds of living pastel artists from portraitists to great animal artists. The three pastel artists who have inspired me to work with pastels are; Leslie B. De Mille: a Canadian born artist noted for his famous pastel portraits, Lesley Harrison: an American self taught artist noted for her realistic equine and wildlife art and the Italian born artist Dino Paravano: noted for his spectacular African wildlife art. I also admire wildlife artists: Judie Rideout, Bradley Parrish and Kim Donaldson for their style and technique with pastels.